KK singer has one of those voices, for which one can even die for. His music, lyrics and voice, everything takes a person to just another world. KK has one of the most versatile voices in Bollywood. He is noted for having a very broad vocal range. KK songs are a craze among people. They keep on listening to his songs on repeat. Some of the amazing numbers in KK songs list include Tujhe Sochta Hoon, Yaaron Dosti, Khuda Jaane and many more. His song Yaaron Dosti has become a topmost preferred song to express the bond of a beautiful friendship. Within a short time of its release, it had become a friendship anthem. We are sure, there would be no one remaining who hasn’t heard this song. He not just sings sweet and romantic numbers, but some amazing party songs as well. For example, his best party track so far is Party On My Mind from the movie Race 2. It is really difficult to talk about all his best tracks here. So we present you an extensive KK Songs list, having all his best tracks till date. You can listen to KK’s all songs all day long. And we assure you, you would still want to listen to them the next day. So just browse our list and listen to all his songs. We hope you enjoyed listening to KK's music. These tracks are some of the best of KK so far. We will keep updating this list with KK's new song as soon as the song releases. KK is much more famous for his singles, 'Pal' and 'Yaaron Dosti'. When they were released, they became huge sensations. In no time, these 2 songs started ruling every youngster's heart and mind. Pal became an anthem song, and Yaaron Dosti became friendship anthem. Due to his soulful and versatile voice, many singers today consider him as their role model. He has inspired many famous singers like Armaan Malik, Arijit Singh, Mohammed Irfan and many more. 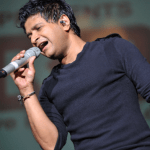 His recent track from the movie Bajrangi Bhaijaan, Tu Jo Mila, was an instant hit and ruled the music charts for a very long time.